Emirates Airline is a Dubai based airline carrier in United Arab Emirates (UAE). Being the largest Middle East airline carrier, Emirates flies up to 94 cities worldwide, with over 2300 flight routes each week. It also flies the much overly competitive "Kangaroo" Route between Oceania and Europe. Emirates also has its own cargo subsidiary airline namely Emirates SkyCargo with its main base also located at Dubai International Airport. Besides concentrating on the flight industry itself, Emirates has also other businesses which includes ground handling, aviation engineering, air catering, and travel and tour marketing. 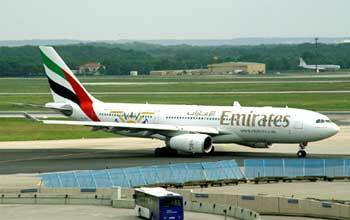 SkyTrax has awarded Emirates Airline as the 9th best Airline of the Year in the year 2007. By the year 2011, Emirates aircraft fleet will include around 54 Boeing 777-300ERs, and at the end of 2014, a total of 55 Airbus A380's super jumbos will also be part of it and that certainly make it the single largest aircraft type in its entire fleet. Being the first and largest customer for the Airbus A380 next generation aircraft, both companies of Airbus and Emirates have worked closely together in the design and development of the A380. Emirates global hub at Dubai International Airport has already prepared to receive the double-decker aircraft at its newly opened Terminal 3. Emirates has an especially huge impact and presence in the Southeast Asian region. The airline actually connects Dubai to more international destinations around the region compared to other Middle Eastern airline. Emirates in-flight entertainment system, also known as ICE (Information Communication Entertainment), was first introduced in the year 2002. 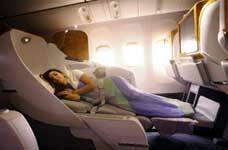 The system is available to all passengers in all seat classes and covers well over 1,200 entertainment options. Panasonic Avionics Corporation is the one chosen to create the new IFE system to be installed on all of Emirates Fleet. 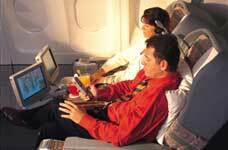 Emirates introduced a high-speed in-flight Internet service in March 2005. The Inmarsat’s satellite system was installed on each aircraft. With that, Emirates became the second airline to offer live international television broadcasts. In the middle of 2007, Emirates has featured a docking capability for the infamous Apple Inc.'s iPod portable music and video player which will allow integration with Emirates' own in-flight entertainment (IFE) system. With over 4800 employees, Emirates Flight Catering Co. offers splendid in-flight catering and support services for airlines operating at Dubai International Airport. In March 2007, a dedicated catering facility was opened just to produce airline meals for Emirates Airlines. More than 100,000 meal tray were being setup daily and the system will be much automated with an electric monorail system handling metal carts, a bin conveyor system to handle the equipment, and also an automated vacuum waste disposal system.